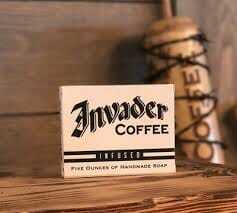 Ingredients: Strong brewed Invader Coffee, coconut oil, tallow, olive oil, sunflower oil, sodium hydroxide, fine ground Invader Coffee grounds, sodium lactate, beeswax, cocoa, 100% clove essential oil, and fragrance oil. Sweat out the hate and wash it away!! !